On paper, this film looks like it might be the brainchild of a strung out, ex-Hollywood director, looking to feed his crystal meth addiction by palming us all off with the same tired story of four guys who go to Vegas on a stag do. And yes, the set-up of Last Vegas does run exceptionally close to that 2009 smash that became a franchise – you know, the one about, well, four young guys who go to Vegas on a stag do. But laying aside the unfortunate echoes, it’s difficult to dismiss a film that features four Academy Award winning actors – Michael Douglas, Robert De Niro, Morgan Freeman and Kevin Kline – and it would, as it turns out, be a mistake to prematurely judge the latest example of the current vogue for ‘silver dollar’ films (think Quartet, The Best Exotic Marigold Hotel and Amour). In the first few minutes of director Jon Turteltaub’s (While You Were Sleeping, National Treasure) buddy movie with a twist, we’re introduced to four childhood mates in the middle of an adolescent tear-up with an older lad. Moments later, we’re thrown 58 years into the future, to find the four boys have become four ageing men, each leading very different lives. Billy (Douglas) is a successful businessman who manages to propose to his 30 year old girlfriend at his dead mentor’s funeral – thus setting the stag do mechanic in motion. Archie (Freeman) spends his life on the sofa with day time TV, while trying to keep his over-bearing son at bay. We meet Sam (Kline) at a dinner party, rifling through the bathroom cupboards trying to find out what prescription drugs his hosts are on, and discover that Paddy (De Niro) has become a bitter grouch, resentful of Billy’s success. As the Vegas plan is circulated, the friends’ initial assumptions about the motivation for the trip – “What…what is it…cancer? !” – set the tone for a film that is spiritual miles away from its hungover cousin. In Vegas, the foursome head straight to the bar, whereupon Billy hears the voice of beautiful singer Diane (Mary Steenburgen – taking the cast to five Oscar winners in a brilliant turn). After realising the hotel they’ve booked wasn’t actually confirmed, our geriatric collective look to Billy, already on the phone to his PA, to resolve the situation. Sam, meanwhile, having been given a condom, a Viagra and his wife’s blessing to do whatever it takes to regain his smile, is busy exploring various options with little success. With the aid of a few drinks, mixing nicely with the array of medication they’re on, the old friends are soon chatting up transsexuals, winning big with their pension stashes, trying to untangle the love triangle developing between Diane, Billy and Sam, pretending to be mafia dons and even finding time to judge a bikini contest in which LMFAO’s bespectacled front man manages to faux tea-bag Michael Douglas. Before long our rat pack find their mojo and, with the help of a bottle of whisky Billy stole in that scrap years ago, they start to remember just how close they were before life got in the way. 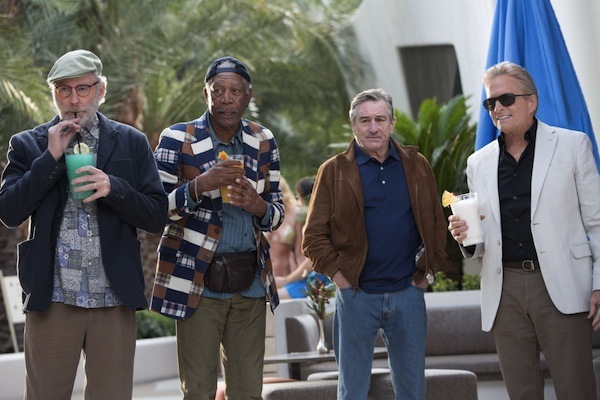 Sure, it may be a little corny, but Last Vegas does a fine job in reminding us, whichever end of the timeline you sit, to seize every moment and shuck off society’s expectations and assumptions. The film’s by-line should read ‘Live, love and laugh’; it’s the one prescription that always works. Last Vegas is a surprising winter tonic. It’s not going to revolutionise Hollywood, but you quickly realise that it’s like a visit to Sin City itself – you’ve just got to dive in headfirst and enjoy.